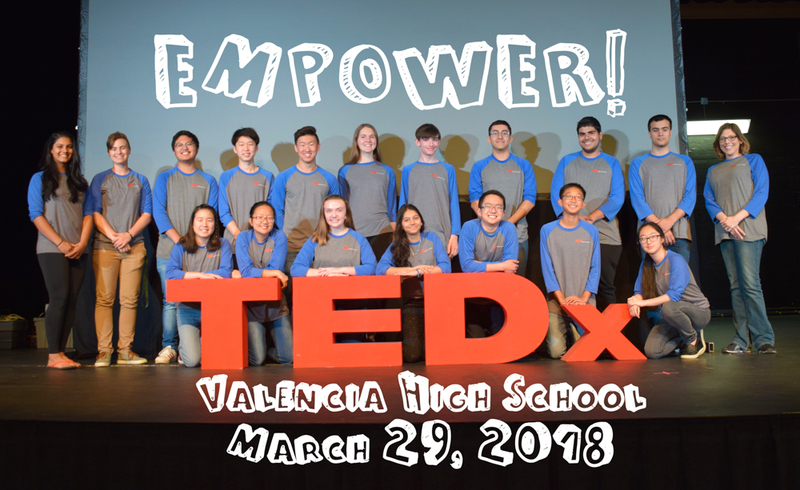 For the fourth year in a row, Valencia High School (VHS) was selected to host a prestigious TEDxValenciaHighSchool: EMPOWER! Youth Event, which took place on March 29, 2018, in the VHS Auditorium, in addition to being broadcast globally via LiveStream. Over 100 students auditioned to be a part of this year’s event, making the selection process extremely difficult. The school’s final program included the following 23 students to speak about varying ideas surrounding the theme, “Empower.” This includes Jenika Kolacz, Maher Abukhader, Ethan Thio, Emily Morgan, Alexander Behura, Adeline Woltkamp, Phil De Vera, Angel Trejo, Khira Mistry, Sonnet Nguyen, Brandon Kwon, Saleem Haider, Emily Nguyen, Connie Chang-=Chien, Lyba Batla, Aidan Miller, Erin Kim, Eric Berndt, and Caitlin Lee. Additional speakers included students Francisco Acosta, Joseph Park, Avery Eun, and Yorba Linda Middle School 8th grader, Aaron Chew. Soon, TEDx will add Valencia’s students to their website and their ideas will be available for the world to view! Regardless of personal politics, Valencia students were encouraged to be open-minded, critical thinkers. Events like TEDx with the theme of “Empower” truly opens the door to such a wide variety of talks infused with the personal perceptions that students bring to concept. This event hoped to inspire ongoing dialogue, insight into a variety of students, and EMPOWER audience members to think and possibly act themselves. Congratulations to event coordinator, Ms. Tara Filowitz (Language Arts Teacher/PastCo-Coordinator), for another successful event. In addition, Rodney Boaz (Business/Technology/Media Production Teacher), Dwight Osborne (Technology Teacher), and Fred Ronquillo (Stage Craft/Technical Theater Teacher) assisted with the event. The event could also not be made possible without Nick Medellin (Student Tech Director), Hannah Cho (Student Assistant), and the wonderful Tiger Tube crew for making the TEDx event look as great on film as it did in person! Be the first to comment on "Valencia High School hosts TEDx event for fourth year in a row"